The VacPan is a new central vacuum outlet that is easily installed using standard fittings and pipe, in both new and existing systems. Vac Pan is a must in the kitchen kick plate! 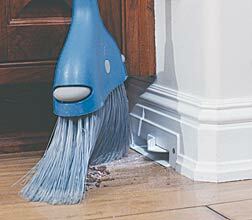 Simply sweep dirt over to the VacPan inlet and it's gone - as easy as sweeping dirt under the rug! And the On/Off kick switch eliminates any bending over. Homeowners will love it! VacPan solves your quick clean up dilemmas while providing you a fantastic new and revolutionary tool! For maximum clearance, use Short 9O degree Elbow for connection to VACPAN. Access can be made through the finished cabinet floor. Cut a 2-3/4" x 3-1/2" access hole, positioned so that final piping connections can be made by reaching through the access hole. 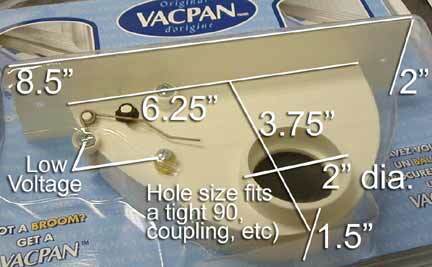 VACPAN Trim Plate can be used to cover the hole after installation.